The latest trend marks a 30-month rising streak since 2012. 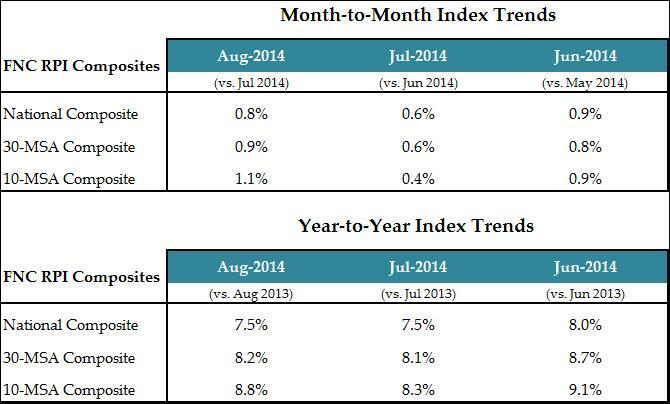 The latest FNC Residential Price Index™ (RPI) shows U.S. home prices have increased another 0.8% from July to August. The latest trend—as of August—marks a 30-month rising streak since 2012. Based on recorded sales of non-distressed properties (existing and new homes) in the 100 largest metropolitan areas, the index increased 7.5% from the same period in 2013—unchanged when compared to July’s year-to-year rate—amid a persistent slowdown in the annual rate of home price appreciation. As of August, completed foreclosures comprise about 11.0% of total existing home sales. In the for-sale market, preliminary data from September and October shows that the average asking price discount and time-on-market (TOM) have hardly changed in the last six months: the discount is only slightly above 2.0% while the TOM remains at about three months. The 30- and 10-MSA composites were up 0.9% and 1.1% respectively in August, rising at a much faster pace than in July—leading to a slight uptick in the two indices’ year-to-year change at 8.2% and 8.8%, respectively. 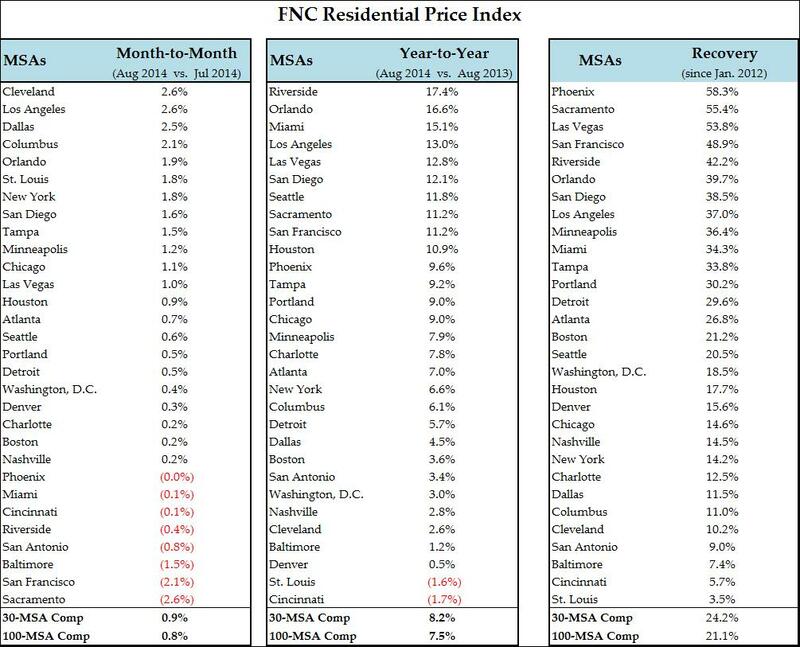 Prices were up in 22 of the 30 cities tracked by the FNC 30-MSA composite index, led by Cleveland (2.6%), Los Angeles (2.6%), Dallas (2.5%), and Columbus, OH (2.1%). Orlando, St. Louis, and New York also showed a strong August month, rising 1.9%, 1.8%, and 1.8% respectively. The Sacramento and San Francisco markets took an unexpected turn, down 2.6% and 2.1%, respectively. This is the first time since the recovery took hold in February 2012 that home prices in San Francisco declined from the previous month. A third California city—Riverside—also recorded nearly a half percentage decline. 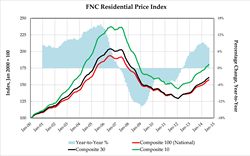 On a year-to-year basis, a third of the cities in the FNC 30-MSA composite index continue to see home prices appreciating rapidly, ranging from 9.6% in Phoenix to 17.4% in Riverside. Only Cincinnati and St. Louis continue to show year-to-year price declines.